"You can't handle the tooth." 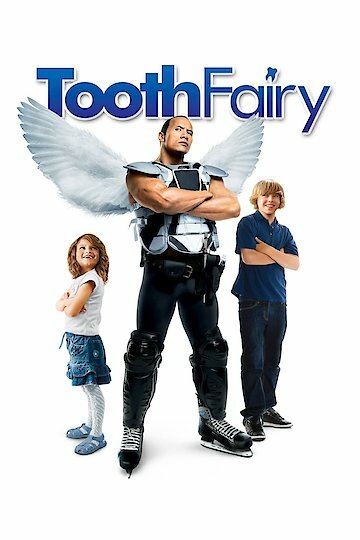 Launched in 2010, Tooth Fairy is a comedy movie featuring Dwayne "The Rock" Johnson, Stephen Merchant, Ashley Judd, and Julie Andrews. The movie was produced with a budget of $48 million and grossed a Box Office hit of $112 million. Tooth Fairy airs approximately 101 minutes. The storyline begins with Derek Thompson, a minor league hockey player played by Dwayne Johnson. Thompson, with a history of roughing up opponents and causing their teeth to get knocked off, is nicknamed the Tooth Fairy in the ice field. Although not as skilled as other players, Thompson is able to build a reputation for his offensive abilities. One night, Thompson is spending time with his girlfriend, Carly, who has two kids, Tess and Randy. Thompson snatches a dollar from Tess' pillow that had been there for the lost tooth. Sleeping later that night, Thompson finds a summon tucked beneath his pillow. He then magically develops wings and is moved into the world of tooth fairies. He immediately finds it hard to believe, causing a scene in the busy workplace of the tooth fairies. He is greeted by Tracy, his case officer, and Lily, the leader of the fairies. Lily then explains to Thompson why he is summoned to the fairly world. He finds out that he is labelled as a dream crusher because of his unsympathetic relationship with children, Tess in particular. Thompson is then demanded to serve a sentence of two weeks, during which time he will be working as a tooth fairy. He is then transported back to his bed. He is relieved, thinking that it was all a bad dream. Soon after, however, he concludes that it wasn't a dream when he receives a text message from Tracy informing him of his initial appointment. To become a good tooth fairy, Thompson is trained by Tracy and is given the necessary tools to carry out his sentence. As the movie progresses, Thompson faces challenges related to his life in the real world and the life he has been subjected to live as a tooth fairy. Tooth Fairy is currently available to watch and stream, download, buy on demand at HBO NOW, Amazon, Vudu, Google Play, FandangoNow, iTunes, YouTube VOD online.